This is the 13th post in a series of monthly posts covering the presidential elections. This post is about the month of June 2015. It’s been a weird month: Three important events happened in the thirteenth month of presidential vacancy, but they’re not really related to one another, so let’s check them anyway. Samy Gemayel’s speech/press conference was not a call for Muslims to join his party as much as it was his way of saying that he would serve both Muslim and Christian interests if elected president. And when I say president, I mean president of the Lebanese republic, and not the president of the Kataeb party. It is said that when his grandfather Pierre Gemayel wanted to become Lebanese president, he was told that he couldn’t be at the same time the leader of Lebanon’s Christians and the head of state: It would have seemed as if Christians were solely in power. 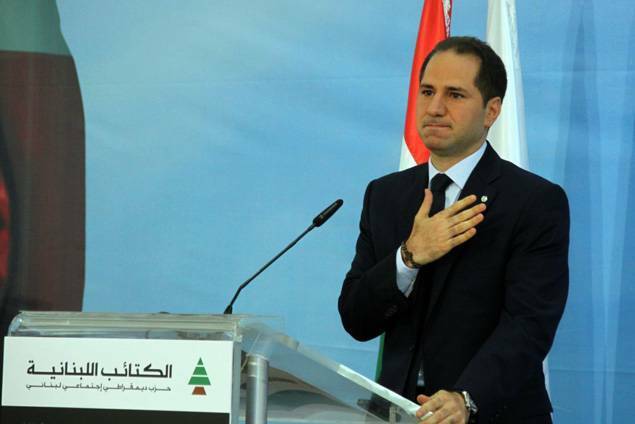 Gemayel’s speech was beautifully written, and it was beautifully written for a reason: He might be the youngest Christian leader among the Maronite four (if he is to replace his father), but he now heads Lebanon’s oldest, most organized (and arguably third biggest) Christian party. His father’s chances were relatively high after Samir Geagea suffered the humilation of losing the first round of the presidential elections to no one in April 2015, but one year after the presidential vacancy, his father is likely to remain a former president. His father’s candidacy is likely to be transferred to him and it seems he’s not playing it like Aoun and Geagea, who are showing themselves as consensual candidates because they ally themselves to Muslim parties. He is playing a much more advanced consensual card: He wants to show that he comes from a party that would gladly accept – and even encourage – Muslim membership, and that not only is he one of the Maronite four, but a truly centrist and non-sectarian politician. Sometimes in Lebanese politics, all you need is the last right name. The right last name is what Sleiman Frangieh and Kamal Jumblatt used to undermine Saeb Salam in the early 70s, by naming Takieddine Al-Solh in 1973 and Rachid Al-Solh in 1974 as Prime Ministers in order to curb the Salam/Karami influence. And ironically, the right last name is what gave Tammam Salam the upper hand in 2014. Salam had other worthy centrist competitors – even billionaire ones – yet it is him who currently presides over the cabinet. Like Salam, Samy Gemayel has the right last name. Like Salam, Samy Gemayel is a member of a coalition, but at the same time leads a faction of the coalition that arguably has the most ties with the other side. The only thing he does not have is a “consensual advantage” over his opponents. We all know that the likelihood of the Kataeb becoming secular is equal to the possibility of aliens forming sectarian parties and colonizing the Sun. And even if he insists on enforcing the decision of making the party wide open to Muslim membership, his authority as a young a leader of the Kataeb will be challenged. So until proven otherwise, Gemayel’s call for the Lebanese Muslims is nothing but a political maneuver he’s using to prove his centrism and become an accepted candidate to the presidency. Machnouk did not seem to support Rifi’s allegations, saying he had “no accurate information” regarding the source of the leak. Rifi visited Machnouk at the Interior Ministry in an apparent move to defuse tensions following media reports that accused the justice minister of leaking the footage and orchestrating the ensuing street protests in Beirut, the northern city of Tripoli and other areas in a bid to undermine the interior minister’s reputation. Rifi dismissed rumors of a feud with Machnouk, saying he enjoyed a “fraternal” relationship with the interior minister. The FM has always had very different ways of doing politics, depending on its electorate. In the North and in the rural regions, where the electorate tends to be more Islamist-friendly and more religiously homogeneous – Sunnis are 85% in Donniyeh, 80% in Tripoli, and 66% in Akkar – the FM’s politicians tend to use a more sectarian discourse (Rifi is a perfect example since it is well-known by now that he intends to lead the FM’s Northern parliamentary fight in the next elections). In Beirut, where the Sunni electorate is less than 50%, more moderate, and actually shrinking, and where a large number of Christian MPs are affiliated with the movement, the Sunni Beiruti FM politicians are by far the most moderates among the Sunnis of their party. The smart double standards of the FM have permitted them to keep their electorate in check for more than ten years now – even Hariri often switches from one side to another depending on the context – but the clash between the two wings of the party was bound happen eventually. Do not be fooled by both politicians’ denial of the power struggle. The power struggle is there and it’s real. And the very fact that, in a joint press conference, Mashnouk refused to accuse Hezbollah while Rifi took pride in blaming M8’s leading party tells us that a mini-war is underway in the Future Movement, and that the relation with Hezbollah will be a key element in this rivalry. Turns out it was a smart move from Hezbollah to give the FM both the justice and interior ministries after all. So as the FPM tries to make Roukoz commander of the LAF without giving in too much to M14’s demands, and as Geagea tries to disrupt those plans with the declaration of intentions, and as Hezbollah continues its fight in Syria, and as an internal mini-struggle for power starts to unravel in the Future Movement, only one thing is constant: We still don’t have a president, and no politician has ever cared less about that fact. 399 days since the 25th of May. 262 days since the 5th of November.